Each year on July 4th, also known as Independence Day, Americans celebrate this historic event with lots of pride and enthusiasm. What does this brings to the restaurant business? In simple words a great opportunity. Here are some facts of that opportunity and how to get the most out of it. Flags should be everywhere, on the walls, flags on hot dogs, cookies or use the flag as curtain or tablecloths to show the patriotic spirits. Patriotic Flower Arrangement is a great idea. Using flowers in America?s colors ? red and white, that could be hyacinths, tulips, or Canterbury bell and finish floral arrangement with a blue bow. Restaurant staff whould wear an Uniform in combination of colors: red, white and blue. Host popular musicians. Popular musicians will attract visitors and bring in new guests ? their fans that may become your new regular customers. Reward program for the customers with free drink or dessert of their choice. Be active on social media atleast 1 week in prior. Promote the menu items which will be on offer on Independence day. Definitely promote the Specials. Outdoor digital signage to promote events in prior would be a great idea. Placing Grill In Front of Your Restaurant. If your restaurant is located in a busy street where will be holiday parade organized it would be a good idea. To make the day more interesting, something spectacular like the idea to make a fireworks for your guests may be interesting. Just ensure that proper precausions and permissions are taken. 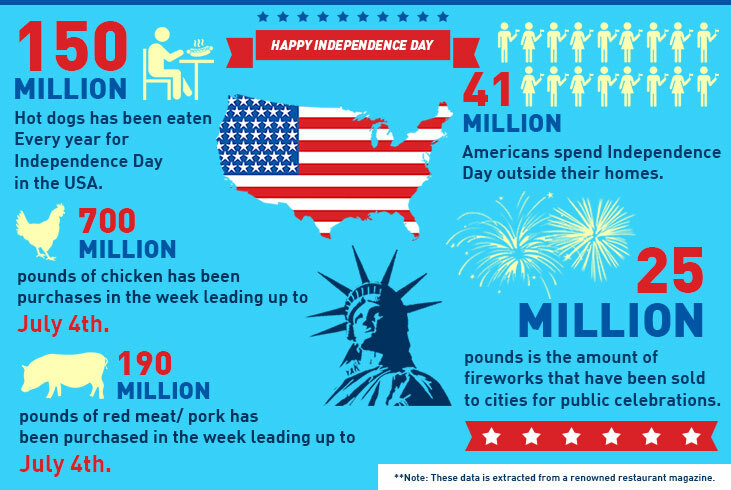 4th of July brings a lot of opportunity for the restaurant business. On an average most of the restaurant business gets a spike on revenue. Create attractive offers so that customers gets lured to enter your restaurant. Wishing you HAPPY INDEPENDENCE DAY ! !